Trouble-shooting tongs in the oil field: At the request of a TRS company we have developed a patent awarded (US9,915.110B2) electronic Power Tong Test Stand that tests hydraulic Power Tong equipment before it goes into the oil field. During the course of the development process we have added so many additional features to the application software that we now have a training simulator that works in conjunction with the testing equipment. In affect the TRS and drilling companies are not only function testing Power Tong Equipment but are now training their associates to have a working knowledge of hydraulic power tong operations. We are featured on this month’s Oilman Magazine, check it out. Train your employees before going onto the job site. Test your fleet of tongs before starting a project. Prevent downtime on a well site. Detect any problems before the tongs go into use. Industry leading industrialized components recognized world wide and field deployable in virtually any environment. Send diagnostics by email or through your network directly from the Test Stand. Also don’t forget to order one of our Power Units that works in conjunction with your tongs and our Tong Test Stand or stand alone as a longer lasting and cooler source of power. Our Power Units operate over 24 hours at a time, last longer due to a larger-than-average fuel capacity and runs cooler with piston pumps, reflective color and the hydraulic capacity. 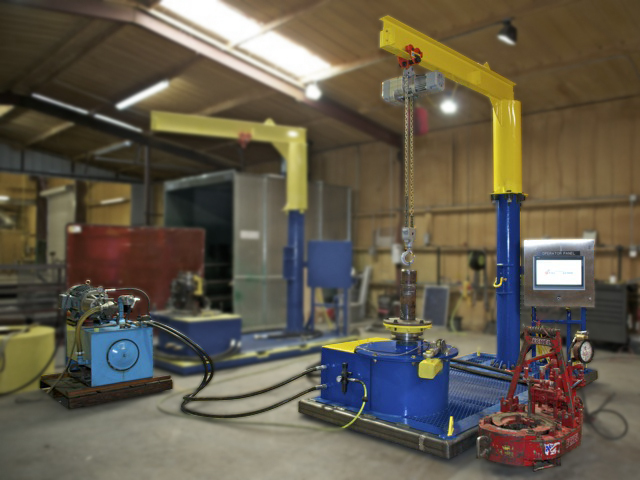 A Better Fabrication offers a comprehensive suite of Electronic State-Of-The-Art hydraulic power tongs testing stands manufactured by industry leaders known for their ability to deliver reliable and technologically advanced oilfield services tools. UL Certified Enclosures house Siemens Industrialized Technology Components that collect RPM, Torque, Hydraulic fluid pressure and return Hydraulic fluid temperature, Hydraulic fluid GPM along with Tong Serial Numbers, Power Unit Serial Numbers and assorted data. • Hydraulic fluid supply and return pressures.